Cleaning with vinegar is one of the easiest ways to make your home healthier and green your cleaning routine. 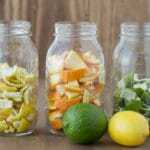 Learn all about vinegar, how to use it effectively, what combinations to avoid, and what natural cleaners to make with vinegar. 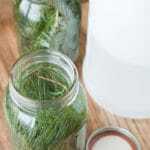 If you’ve ever tried making your own homemade cleaners you know that they can range from very useful to total disaster. I hate wasting time and ingredients by making a cleaner that doesn’t work effectively. The #1 reason green cleaners fail? They use the wrong ingredients! Some mixtures combine ingredients that neutralize one another or create dangerous reactions. Other ineffective cleaners choose the wrong ingredients for the job. Where it is safe to use. What it should (and should not) be mixed with. Readers often ask me why I use vinegar in my homemade cleaners since it has a potent smell. Today I'll share some basic facts about vinegar and explain why I love cleaning with vinegar. Vinegar is a weak acid that is commonly used for cooking (adding sour notes to food, preserving, or pickling) and household cleaning. It is edible and biodegradable but it can burn sensitive skin or eyes. Vinegar is a great green cleaning ingredient because its acidic pH allows it to break down alkaline or basic substances that soil our homes and laundry plus it has a long shelf life at room temperature. Fruits or grains are allowed to ferment into ethanol alcohol (think grain alcohol or wine). The alcohol undergoes a second fermentation that converts it into acetic acid. Vinegar can also be created by distillation. This process starts with distilled alcohol (usually grain-based ethanol made from corn or wine) which is then fermented into acetic acid. *In all three processes the resulting vinegar is strained and/or pasteurized then diluted with water to the desired percent of acetic acid (usually 5 to 8 percent). What are common vinegar types? White vinegar, apple cider vinegar, and wine vinegar are the most common types of vinegar in the United States. White vinegar is the type of vinegar most commonly used for cleaning. Let’s step back to high school chemistry class to examine the cleaning power of vinegar. Remember the pH scale? The pH scale is used to determine if a liquid is acidic, basic, or neutral. The scale runs from 0 to 14, the center of the scale is neutral (number 7). Solutions from 0-6 on the scale are acidic. Solutions from 8-14 are basic. When a base is added to an acid (or an acid added to a base), the solution moves toward the middle of the pH scale as it is partially or fully neutralized. Concentration (the amount of acetic acid in the vinegar) which is measured in percent. Acidity, measured as a pH value. White table vinegar usually contains 5% acetic acid and has a pH of approximately 3. White cleaning vinegar has a higher percent of acetic acid (usually 6-8%) and a pH of around 2. * 6% vinegar may sound like it’s only 1% stronger than 5% vinegar, but it is actually much more powerful. Check out the pH chart again. Each whole pH value is ten times more powerful than the next whole value. So pH 2 is ten times more acidic than pH 3. 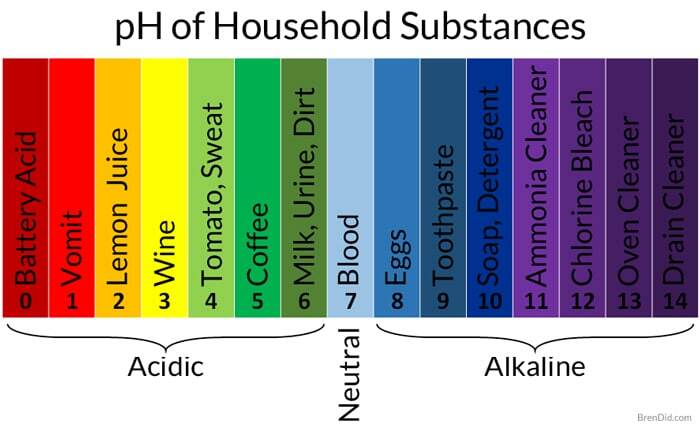 Some of the substances that soil our homes are basic when measured on the pH scale, so acidic cleaners work best for cleaning them. Some examples of the basic soils found in homes include hard water stains, mineral deposits, and soap/detergent residue. The acid in vinegar reacts with and breaks down these alkaline or basic substances. What can you clean with vinegar? Windows, mirrors and glass: vinegar prevents mineral deposits and hard water build up. Bathroom fixtures (faucets, shower head, shower, tub, sink, toilet): vinegar removes hard water buildup and removes soap scum. 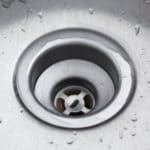 Drains and garbage disposals: vinegar neutralizes the odor causing particles in garbage disposals and drains (Tip – vinegar is not great for cleaning drain clogs). Trash cans: vinegar neutralizes the odor causing particles in garbage cans. Linoleum floors: a vinegar/water solution gently removes dirt and residue, plus vinegar removes buildup from previous cleaning product to restore shine. Solid surface countertops: laminate, ceramic tile, and solid surface countertops can be wiped with a a vinegar/water solution to remove dirt and residue (Tip – be cautious using vinegar on grout). Coffee maker, tea kettle and teapot: vinegar removes mineral deposits and neutralizes odors. Appliances (oven, refrigerator, microwave, dishwasher): wipe down the interior of appliances with a vinegar/water solution to removes dirt and residue while neutralizing odors. Stainless steel: clean and shine stainless steel with a mixture of vinegar and oil (Tip – try this homemade polish). Laundry: vinegar makes a great fabric softener in the washing machine, it helps to breakdown and remove the soap or detergent and minerals in the water leaving clothes softer. Dishes: vinegar can be used as a rinse aid in the dishwasher (place a small cup on the top rack) or added to rinse water when hand washing dishes, it prevents hard water buildup and helps remove detergent. What should you NOT clean with vinegar? Since vinegar is acidic you should be cautious when cleaning surfaces that can corrode. If left on too long or used in too strong of a solution the acid in the vinegar can damage the surface, dull the shine, or leave a cloudy mark. What cleaners should NOT be mixed with vinegar? 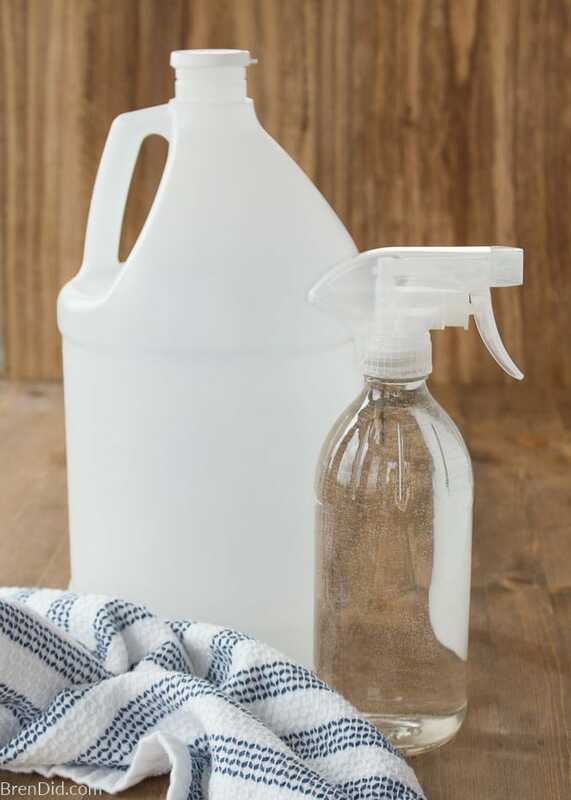 Cleaner combinations that mix an acid and a base (such as vinegar and castile soap or vinegar and baking soda) cancel out the cleaning power of the both substances. 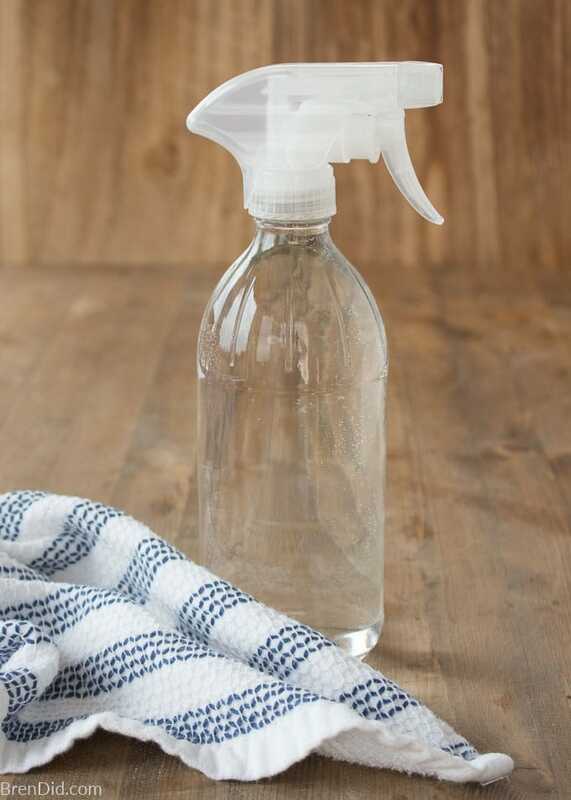 *Have a favorite vinegar cleaner? Share it in the comments below. I love new green cleaners! Is there alcohol in vinegar? No. Vinegar is made from alcohol, but the fermentation process turns the alcohol into acetic acid. Is there water in vinegar? Yes, vinegar is a solution of water and acetic acid. 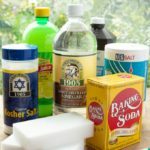 What is white vinegar made from? White vinegar is most commonly made from grain alcohol (ethanol made from corn) which is fermented into acetic acid and diluted with water. It’s also called distilled white vinegar. What is apple cider vinegar made from? Apple cider vinegar is made from hard apple cider (ethanol made from apples) which is fermented into acetic acid and diluted with water. What is the difference between distilled white vinegar and white vinegar? Technically white vinegar can made from any grain containing sugar and undergoes a 2-step fermentation process: grain ➝ alcohol ➝ acetic acid. (The most commonly used grain is corn.) While distilled white vinegar starts with alcohol and undergoes a 1-step fermentation process: alcohol ➝ acetic acid. However, the terms are used interchangeably in the United States. What is cleaning vinegar? Cleaning vinegar is white vinegar with a higher percent of acetic acid usually 6-8%. White table vinegar usually has 5% acetic acid. In most cleaning solutions you can use cleaning vinegar, white vinegar, or distilled white vinegar interchangeably. What is spirit vinegar? Spirit vinegar is another common name for distilled white vinegar. It is made by fermenting distilled alcohol into acetic acid. What is pickling vinegar? Pickling vinegar is distilled white vinegar with a high content of acetic acid. In the United States pickling vinegar typically has 6% acetic acid. In some countries pickling vinegar has 18-20% acetic acid and must be diluted before use. What is “the mother” people talk about when discussing vinegar? Unpasteurized vinegar has a bit of gunk in the bottom of the bottle that is sometimes called “the mother” or “mother of vinegar”. This acetobacter bacteria that aids in the fermentation process. 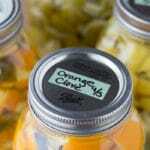 Most commercial vinegars are pasteurized to kill the bacteria because it looks unappealing. Is vinegar a good degreaser? Not necessarily. Vinegar can help break down the basic substances in greasy messes but usually needs an added detergent to clean up the oil completely. To make a natural degreaser using vinegar mix 1 cup water, 1/2 cup vinegar, and 1 tsp dishwashing detergent. Do not use Castile soap or baking soda in vinegar cleaners. Is vinegar safe for the environment? Vinegar is edible and biodegradable, so it won't harm the environment. However, since it is an acid, it should be disposed of properly. Don’t pour it on the lawn, for example. It will kill plants/weeds and can be used as an herbicide. Like my green cleaning recipes and tutorials? Sign up for my free newsletter below and never miss a thing. Vinegar is the most multipurpose ingredient ever. We go through it like crazy. Love the extra information to help explain to others why we use it. Thanks, Chris. I love vinegar too! I just purchased 25% vinegar for cleaning whereas I was using 4% before. What dilution would you recommend with water? My cleaning solutions consist of vinegar, water and essential oils. I also make a shower and toilet scrub with vinegar and dawn dish soap. Marlo!!! You’re stretching my brain this morning! 25% acetic acid vinegar is a very strong concentration! Cleaning vinegar is usually 6% acetic acid. In order to reduce the percentage of acetic acid in your vinegar you need to use the general dilution equation for chemicals which is: (C1)(V1)=(C2)(V2) where C1 and C2 are concentration of the chemical before and after the dilution and V1 and V2 are volume. In your problem you have (C1 – 25% acetic acid vinegar)and you want (c2 – 6% acetic acid vinegar) so the equation should be or (25%)(4 ounces)=(6%)(V2 ounces). So you need to add about 16 ounces (2 cups) of water to 4 ounces (1/2 cup) 25% strength vinegar to make 6% vinegar. 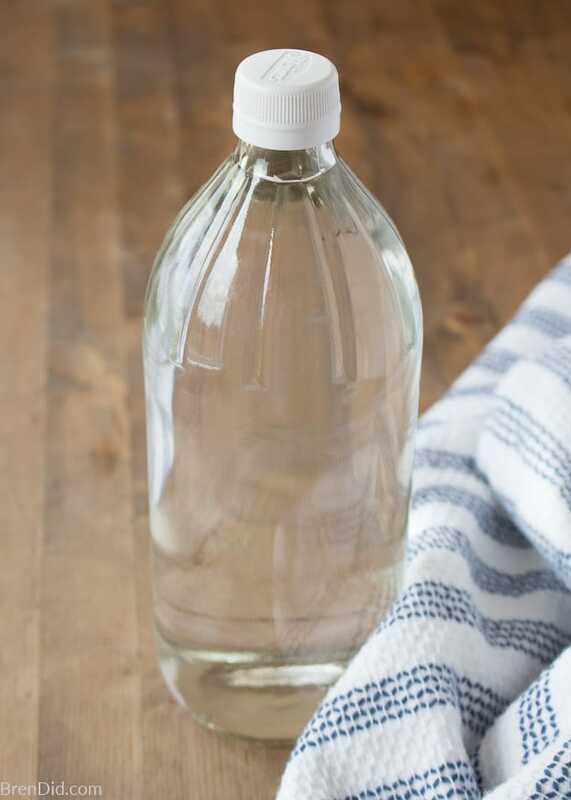 A popular cleaning vinegar manufacturerecommends a mixture of 1/2 cup 6% vinegar to 1 gallon (16 cups of water). So you would add an additional 16 cups of water to get to thier recommended cleaning dilution. To get that cleaning dilution quickly my best estimate is to add 1/2 cup (4 ounces) of 25% vinegar to 18 cups (1.125 gallons/144 ounces) water for general cleaning. For the shower cleaner, I would dilute the 25% strength vinegar to make 6% vinegar (as calculated above) then continue with the recipe. My no scrub shower cleaner directions are here. I’ve never seen 25% vinegar in stores. Where did you get it? Hi Bren, Thanks for this article. Very educational in a sea of recipes with no real reassuring info to support them. Can you please advise on why so many recipes use vinegar and baking soda to clean toilet bowls.. What would you recommend? Megan, I’m not sure why so many cleaning recipes use both baking soda and vinegar. Perhaps the fizzing reaction makes people feel like it is an incredible cleaner. I use a spray bottle of dish soap and vinegar to clean inside the toilet, spritz the inside of the toilet, and then scrub with my toilet brush (it’s my no scrub shower cleaner recipe, I use it to clean sinks, showers, tubs and toilets so I only need one cleaner). It contains acid to fight hard water stains, vinegar to deodorize, and detergent to clean. Hope this helps! Hi Bren, Thank you, your reply, the spray worked great! I have made three batches of the no scrub shower cleaner, multipurpose cleaner, and refresher spray, as well as one batch wonderdressing, one polish, 5:00 window cleaner and some lemon disinfecting spray. Now I have three questions. First off, what is the shelf life of these cleaners? Is there a way I can know when they go bad? Secondly, what is the main difference between the polish and the wonderdressing? I really love your minamalistic approach and was wondering if I could combine these two products? Lastly do you prefer the all purpose cleaner or the no scrub shower cleaner for toilets? 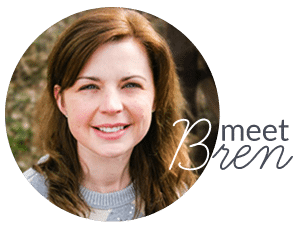 Thank you again for your wonderful blog, I love the logic behind your approach and that you are basing your recipes on a strong foundation of knowledge. Oh sorry, to clarify, I was asking if the wonder dressing and wood restorer for hardwood floors could be combined. I’ve not tried combining them. Let me know if you do! I use a solution of vinegar and water to rinse fruits and vegetables, specially small berries like blue berries , strawberroes etc, before storing them in the friedge. they stay fresh longer and mold does not grow on them. If I keep them long enough, they dry out and I eat them that way. My question is: what is the weakess solution (part water/vinegar) to use to be efeective mold preventer. Thanks. Nyd. According to this test, washing fruit with a solution of diluted vinegar (one part vinegar to three parts water) then rinsing afterward with pure water removes 98 percent of the bacteria. 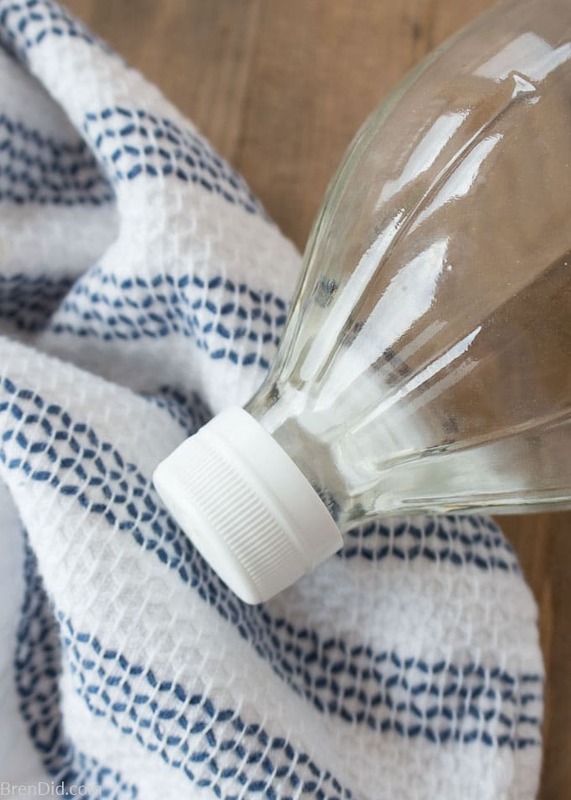 Use a spray bottle filled with three cups of water and one cup of white vinegar,mist the fruit or vegetables all over with the solution then rinse under the tap. Lettuce and other leafy vegetables need to be soaked. Yes, you can clean with apple cider vinegar. I generally use white vinegar because it is cheaper. Good luck! 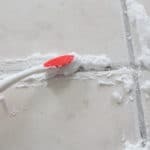 Is Vinegar Powder an effective way to clean? I’ve never used vinegar powder so I am not sure. I’ll have to check it out! 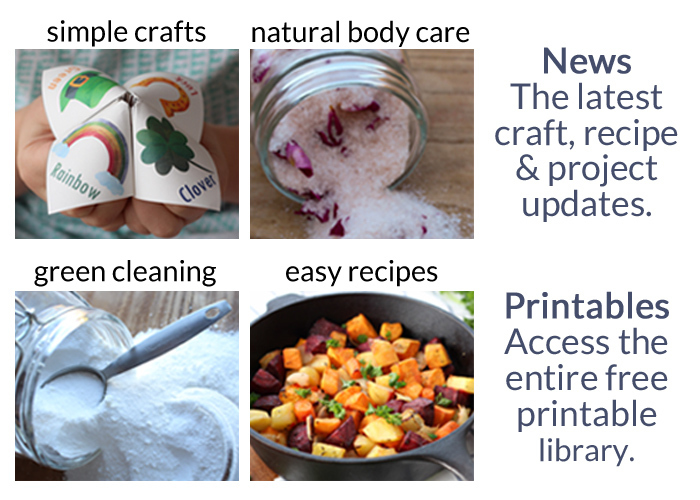 What do you use vinegar powder for in your home? Where do you purchase the sprayers that are on top of the bottles? Thank you so much! I get them in bulk on Amazon or save one from an old product (make sure to clean well before reusing). What do you recommend to use for cleaning granite countertops, laminate floors and ceramic tile floors? I did not know that vinegar can corrode these. I hope I haven’t done too much damage! Yes this helps a ton! Thank you!